Say I feel like having my team meeting in the atrium. But I haven’t considered the fact that it’s a premium space in the building for major events. A few colleagues from hospitality interrupt us half way through our meeting. They’re a little exasperated that we’re in their way, explaining that they need to set up catering for the CEO’s presentation in an hour’s time. Apparently we shouldn’t be here without approval. ‘Who can give us approval?’ we ask. They shrug, ‘Sorry, we have no idea’. We move on, pacing through the office in search of a free room that can accommodate the whole team. By the time we find one, we’ve wasted a quarter of our meeting time. Not only that, but half an hour in, we’re kicked out again by another team who booked the room in advance. So we give up and hope next week’s meeting runs more smoothly. Let’s face it – rules, whether we like it or not, are all around us and for good reason. Just imagine what would happen if we didn’t all drive on the same side of the road or if nobody paid their taxes. Meeting Room Booking Rules can play a significant role in helping your office run smoothly and creating a harmonious working environment. The scenario we described above could be easily avoided by implementing some basic rules. The key word here is ‘implementing’. Most organisations already have rules, some explicit and others unspoken or implied. However, too often, we see that these rules, guidelines and processes aren’t actually implemented in their meeting room booking systems. This leads to unwanted behaviour; staff book the largest rooms with the best views, unnecessarily hog scarce video conference facilities, or book services at the last minute placing undue stress on your internal service teams. The challenge is this; how do you communicate and enforce meeting room booking rules in such a way as to be considered helpful by your staff? The answer? 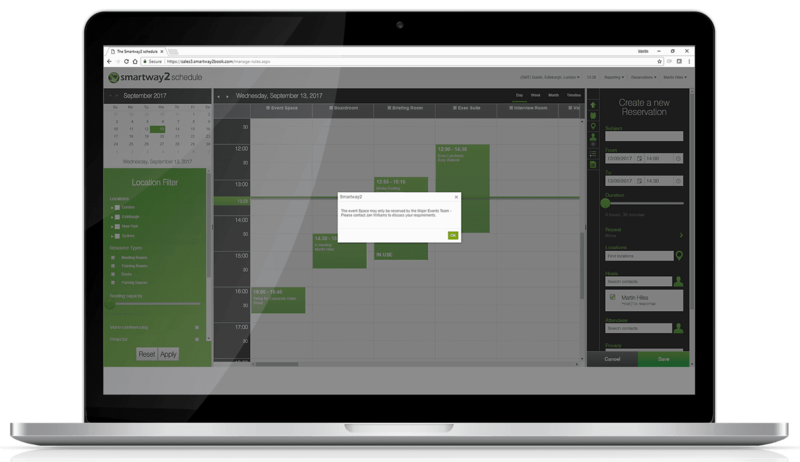 You need a meeting room booking system with a flexible rules engine that allows you to implement highly specific (and sometimes complex) rules that trigger at the right time and provide useful guidance for your staff. I open Smartway2 to book the Atrium and … hey, what’s that? The very instant I select the Atrium, a rule triggers and a message pops up letting me know that bookings for the Atrium can only be done via the Facilities team with details of whom to contact. I decide I don’t really need the Atrium after all and book a regular meeting room. The meeting goes without a hitch. Everyone’s happy and no time is wasted. Do you have a department that’s particularly protective of their meeting spaces? It’s common if they’re in high demand. For instance, HR often needs to keep a close eye on interview rooms to make sure they’re available at the right time. Yet sometimes they might allow others to book them, subject to approval, when they’re free. In this scenario, creating a rule and approval process in Smartway2 keeps everyone happy. Now when I try to book an interview room, a rule triggers telling me the booking will be subject to approval from HR. It can even tell me what the SLA is for them approving it. So I can choose to go ahead with the booking, enter a subject (e.g. ‘can I book this room?’), and choose refreshments and any other options that are available. My booking goes in. It’s displayed in the calendar as orange because it’s tentative, subject to approval. When the booking turns green I know HR has given me the go-ahead. Say Sue from Account Management is pitching to important clients. She booked the boardroom in advance, but assumed she could worry about catering later. A couple of hours before the meeting she realises she hasn’t ordered a working lunch. She quickly sends an email to hospitality, then rings them to make sure they got the email. Chaos ensues when the catering team inform Sue they need at least 24 hours’ notice. They’re already stacked with orders. Soon someone is running out for sandwiches. The pressure is on to cobble something together that won’t leave the clients with a bad impression. To avoid this kind of situation, Smartway2 allows you to configure available services and refreshments on a room by room basis, together with rules that specify for how far in advance they can be ordered. Furthermore, notifications, reports and digital signage can be used to ensure that the right people are informed with plenty of notice. Helpful hint: You can use rules to determine what should happen when a user wants to cancel a meeting at short notice and there is an associated catering order. Facilities teams can also fall foul of people booking meeting rooms without rules being in place. In some rooms, like the Briefing Room, there might be the option of flexible furniture layouts. In Smartway2 I can choose from the options available. I can even control the workflow for someone to go and rearrange the furniture. What if you have rooms with removable partitions down the middle? Say I need plenty of space for my meeting. That means I need facilities to take it down so I can use both spaces. When I try to book the room in Smartway2, I can see the option to make it a combined request and use the whole space. The system knows which spaces are linked. The Facilities team is often burdened with last-minute requests so in this case we’ve configured an approval workflow so they can make sure they have someone available to fulfil the request. When I make my booking I can clearly see it’s subject to approval. All of this workflow is easy to define in Smartway2 and far from getting in the way, these rules are helping everyone work the smart way. Have you ever hogged important equipment, without even thinking about it? Many of us are guilty of booking, say, the video conferencing room simply because it’s the nicest room. Even if we’re not going to use the kit. That’s bad. But, you guessed it – Smartway2 meeting room booking rules to the rescue! Now when I try to book the video conferencing room, it asks me to confirm that I’m going to use the VC equipment. If I say yes by checking the box, the system allows me to go ahead and make the booking. A simple rule like this can help people think twice about whether they really need a certain space, freeing up your gear for those who need it most. If you’re a superuser with admin privileges, it’s easy to see which bookings are waiting for your approval. With one click you can approve a meeting room booking or desk booking there and then. Perhaps you get a lot of meeting room booking requests. In that case you might prefer to go into ‘reservations awaiting approval’ and view the queue of bookings in there. You can go in and look at each one and make changes. Or simply hit the approve button and it’ll disappear from the list. ‘Reservations awaiting approval’ and all other reports in Smartway2 can be used on an iPad or other tablet, handy for service personnel that are always on the move. This is particularly useful for things like teas and coffees, as well as the authorisation process on-the-move. If you’re authorised to approve a particular room, when you try to book it, you can simply go ahead. Any booking you make will automatically approve and by-pass the procedure. 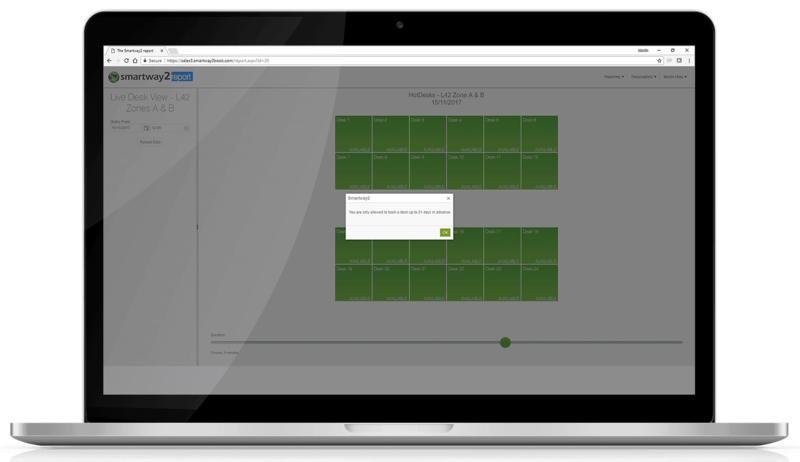 Is your meeting room management system configured the smart way? Configuring rules in Smartway2 is easy. Rest assured, no troop of consultants need show up to get it done. Meeting room booking rules don’t just support the way you work. They enforce a smooth, efficient way of working that instantly becomes business as usual. Just by using the system, everyone naturally rolls with the rules and works the smart way. So you avoid the usual costly pitfalls of poor meeting room management. 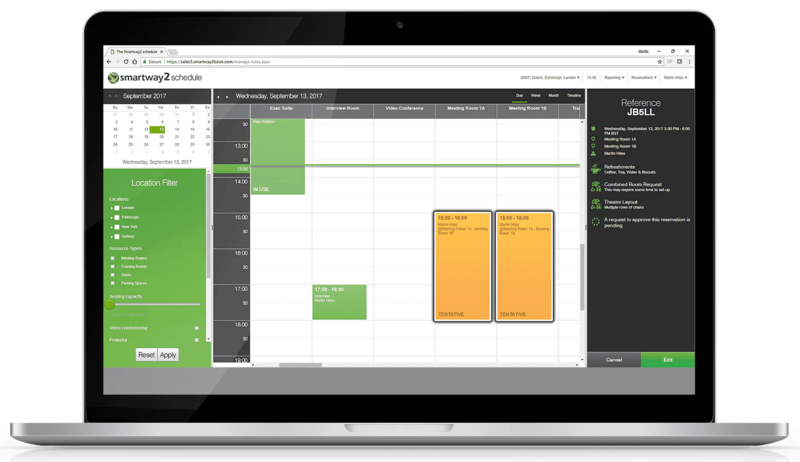 Your meeting room booking system should stop problems from occurring, rather than applying sticking plasters. That way you can avoid putting extra pressure on colleagues to fix resource mix-ups and oversights later. That’s why Smartway2 is designed to stop people wasting time. The system prevents you going down paths that lead to dead ends. 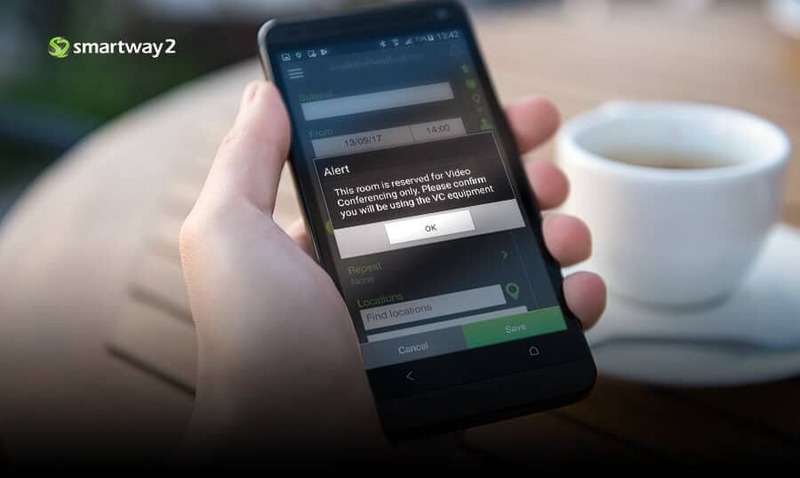 Instead, users are alerted there and then, when making a booking. If approvals are needed, or if certain services aren’t available, they know right away. 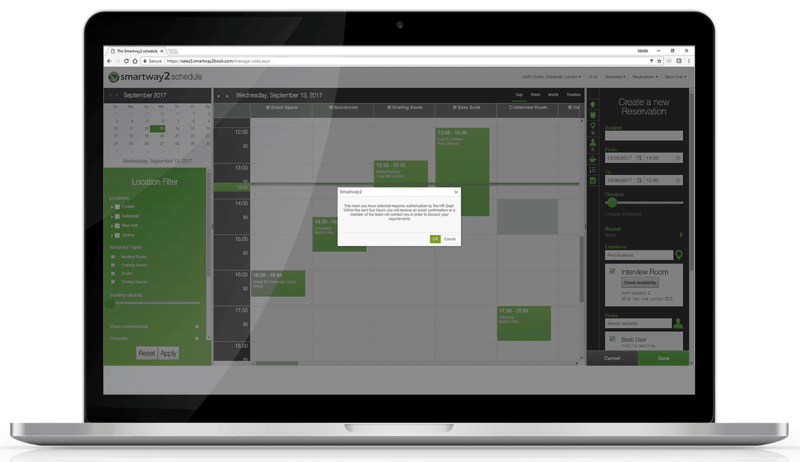 Rules are enforced in all user interfaces, whether you’re using a web calendar, the Smartway2 mobile app, kiosk, or our Outlook integration. Rules encourage users to adapt to processes and workflow that make sense for everyone. For example, Smartway2 users will shift their meeting by an hour or choose a different room, to give hospitality time to prepare tea and biscuits. Rather than calling or emailing them with an impossible last-minute request. These are the small things that make a big difference to a smooth operation. Particularly when meetings are a vital part of your everyday business. Smart use of meeting room booking and desk booking rules can transform you workplace. If you’d like to see more feel free to request a demo. We love sharing ideas on how to improve meeting room management in your organisation, so give us a call if you’d like to talk or contact us here.